If you are hurrying to reply, System → Administration → StartUp Disk Creator -- no, that's not what I'm talking about. 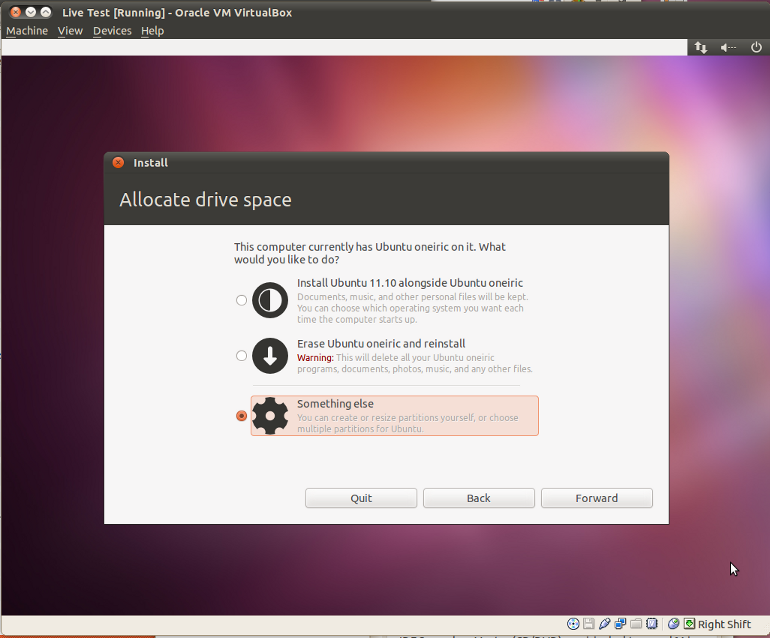 I want to try Ubuntu 11.04's Unity without touching my existing Ubuntu install. To do this, I need to install the nVidia drivers first (sigh). To do this, I need changes to persist a reboot. To do this, I need to really install Ubuntu on a USB key. I tried to make a USB key from Testdrive, then boot from it, then choose "Install Ubuntu." The installer refused to install to the installation media itself. ...but the installer didn't detect the disk properly. You should do this with testdrive . Note. If your key is smaller than 4.4 GB (for Ubuntu 11.04 (Natty Narwhal)), you must get the alternate installer. The Desktop installer refuses to continue if there is less than 4.4 GB of free disk space. 2. Format the USB disk. This is important if you already have anything looking like a Linux install on your disk, or the installer will not want to touch that disk, for some reason. I failed earlier because I didn't perform this step, so skip at your own risk! You need a key that is at least 3 GB in size. You can do so from System → Administration → Disk Utility. Choose the destination USB key, unmount all partitions, and select Format Drive. You need to make sure you select "Don't Partition" before it lets you format the disk. ...to install the i386 ISO of the Natty Narwhal desktop -- the file name will vary if you download a different ISO image. Details for your virtualization solution of choice will vary, but you want to use the device file of your USB key as the VM's hard drive. Append -boot order=d to the kvm command to make it boot from the image in case it tries to boot from the 'hard disk' and fails because it cannot find an operating system there. At this point you are working on a virtual machine that sees your USB key as the only connected hard drive. From inside the "QEMU" window, install as you would normally do. Partitioning. Avoid using the automatic partitioning system, as it will create a swap partition on your USB key. That's no good, as swapping becomes super slow (seconds-long system freezes slow) and quickly kills your drive's life. Simply allocate a single partition for /. If you're using the alternate installer, make sure you set the noatime flag to further reduce the amount of writes to the disk. Updates. Skip the option to automatically download and install updates. It is not guaranteed that the repositories will be in a consistent state by the time you run the installer. Personally, I'd rather manage the upgrades manually with a tool such as aptitude (which does no longer ship with Ubuntu by default). Alpha-quality software. Things are a little wonky -- it is alpha quality software, after all. I had dpkg exiting with error code 1 without being able to review the error - no packages were broken as a result, however. I tried to shutdown the virtual machine cleanly after the setup, but it hung. On a reboot, however, the system booted fine. You may need to fiddle with your BIOS settings to make this work. A nice (or annoying, based on your use case) thing about Ubuntu on a USB is that next time it'll refresh GRUB, it'll also detect and add to the list the kernels and operative systems on the HDD. This should let you boot straight into your HDD from your USB key's GRUB. 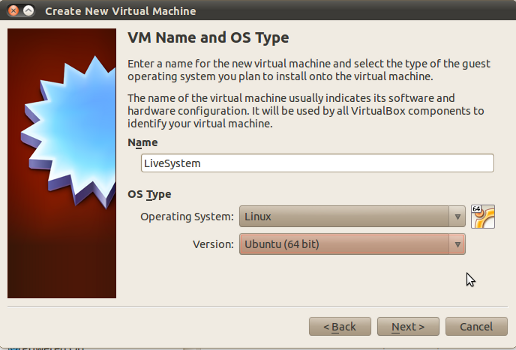 In order to install Ubuntu to a portable external USB drive (either disk or stick) we may also use Virtual Box to install from a virtual environment. For USB 2.0 support the closed source but free PUEL-version of Virtual Box is needed. We then need to assign system memory (e.g. 1024 MB), graphics memory (e.g. 128MB), and adjust CPU settings according to our host hardware. Also we may want to create a bridged network in order to be able to download files during the installation. 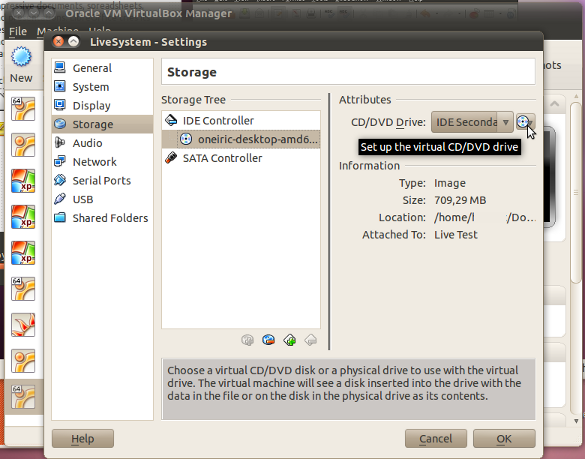 In the Storage menu from Virtual Box Manager we select the .iso image of our installation CD to mount as CD drive. Make sure the boot order of the virtual machine is set to boot from CD. After we started the virtual machine (USB support needs to have been set up first) to boot the installation CD we need to mount the USB drive either by clicking on the small icon in the bottom panel or by choosing from Devices -> USB Devices menu of Virtual Box Manager. We need at least a partition with a mount point root (/). In the example above an additional /home partition was created. By unticking Format we keep the data that may already be there. A /swap partition may not be needed for an USB-stick or a portable drive. By selecting Install Now we start the installation to our USB drive. Consider that this installation may take a bit longer than we are used to. After the installation has finished we may unmount our drive eith the brand new operating system and boot from any other machine to customized it to our needs. Do not forget to enable booting from USB in this computer's BIOS. 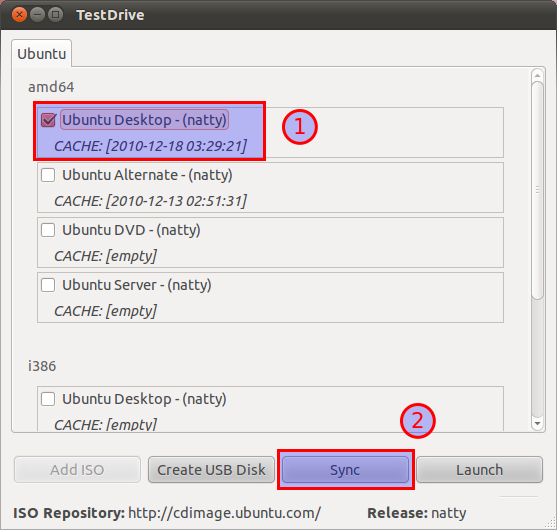 Have a look at this guide and video on my website on installing Ubuntu to a USB drive. It will help you do exactly what you want and it's very simple. Installing Ubuntu to an external hard drive or USB memory stick is a very safe way to install Ubuntu. If you are worried about changes being made to your computer, this is the method for you. Your computer will remain unchanged and without the Usb inserted, it will load your operating system as normal. When you connect and boot from the USB drive you will be given the choice to load Ubuntu or your usual operating system. What we need to install Ubuntu to a USB drive is a computer, an Ubuntu live CD/USB, and a USB drive. 8 GB is the minimum recommended size for a functional and useable system (although 4 GB is the minimum). We recommend an external hard disk and at least 20 GB. It is recommended to partition your USB drive, but not necessary, assuming you have 2GB RAM or more. Partitioning can be done from the Ubuntu live CD/DVD using 'disk utility', or from the installation partitioning menu. We recommend using a Live CD/DVD and unplugging any other USB drives as this makes life easier. We will assume that you are using an unpartitioned USB drive and CD/DVD for this guide. Insert the Ubuntu Live CD/DVD, switch on the computer and tell it to boot from CD/DVD using your 'BIOS'. It will take a couple of minutes to load and you will be presented with two choices. 'Try Ubuntu' or 'Install Ubuntu', you should select 'Install Ubuntu' You will then be presented with a number of options. You need to select the bottom option 'Something Else'. This will bring you to the partitioning menu. Your Primary hard drive will be listed as 'Sda' followed by any partitions that are on it like Sda1 or Sda2. Below this will be your usb drive, it will be listed as 'Sdb'. Click on 'Sdb1' which is the only partition on the drive and select 'change'. You need to select 'use this partition as Ext4 File System' (some distributions such as Mint reqiure you to manually select 'format' at this point). Then you need to set the 'mount point' as '/' which is the root file system and click OK. You will be taken back to the previous menu and that partition will have a tick next to it. Now click on 'Sdb' just above that partition, this selects it as the device to install to. Now just below is an option for where the bootloader is to be installed. It is VERY IMPORTANT that you CHANGE THIS OPTION. THE BOOTLOADER MUST BE INSTALLED TO YOUR DEVICE listed as '/dev/Sdb'. If you do not do this the bootloader will be installed to your internal drive. You are now ready to install to your external device, simply click 'Install'. You will need to answer a few simple questions like 'name' and 'create password', then you can sit back and relax. You will need to tell your BIOS to boot from the USB device each time you want to use it. You can easily set USB as your first boot device in the bios, and your normal system will load if the device is not connected. Do not be surprised if your Usb installation takes 3 or 4 minutes to fully boot, especially when using a cheap Usb memory stick. If you choose to install from a usb drive instead of CD/DVD, or you have multiple hard drives and Usb drives connected you need to make sure you are installing to the correct device, as it may not be sdb. The easiest way to ensure that you are installing to the correct device is to use disk utility. Open disk utility before connecting the device and note the devices on the left. Then connect your device and it should appear at the bottom of the list. Click on that device and look at the top right of the window for 'Device'. It will say something like 'Device : dev/sdc' and so 'sdc' would be the device you need to install to. If you are talking about an actual install, as in a full Ubuntu install rather than just a Live USB type then what you can do is use an external hard drive that plugs in via USB and install to that via the following method. Please Note: The following steps were tested using Ubuntu Version 9.10, but has not been tested with the later versions. Use at your own risk & discretion. A LiveCD or LiveUSB with Ubuntu. An external Hard Drive with USB capability. Open up your computer and remove the Hard Drive. Plug in your external USB Hard Drive via the USB cable. Stick in your LiveUSB or LiveCD and then boot up your PC. Open up the boot menu, and choose to boot from the LiveCD/LiveUSB. During the installation process you should your external hard drive listed, install Ubuntu to that. Finish the installation process, turn off your PC, and put your other hard drive back into your computer. Reboot your computer, go to the boot menu and select your external hard drive and attempt to boot from it. If it does congratulations, you now have an external hard drive with a full fledged Operating System on it. and I have added some extra steps necessary for the installation to an external drive. If you install in BIOS alias CSM alias legacy mode, the installed system will work in BIOS mode. If you intend to use the external drive in new and middle-aged computers, I can recommend that you install from an Ubuntu 64-bit 'amd64' iso file. These 32-bit systems will work with 32-bit and 64-bit computers but only in BIOS mode, when installed according to the instructions [in this answer]. When the computer is shut down and disconnected from the power grid, disconnect (and/or unplug) the internal drive(s). In some computers it is possible to disable the internal drive via a menu of the UEFI-BIOS system. This makes the installer treat the external drive, where you want to install Ubuntu, like it were an internal drive (and the installer cannot tamper with the internal drive). Plug in the Ubuntu boot/live/installer drive (DVD disk, USB drive, memory card) and boot the computer from it. Proceed in your native language if you wish. 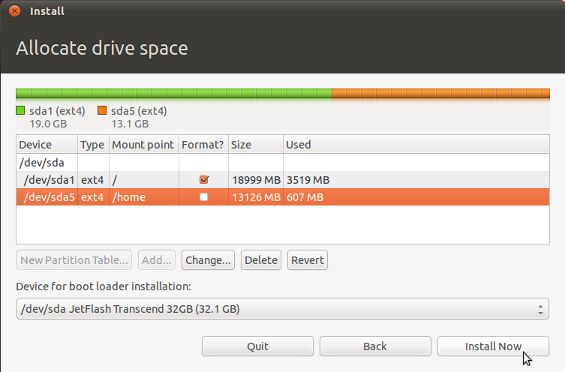 Connect the external drive (HDD, SSD, pendrive, memory card) where you want to install Ubuntu, the target drive. Plug in external power to this drive if possible. It might not be enough with the power from the computer's USB plug. Install third-party software ... option available. If you want the system to be portable between computers, please avoid third-party software, particularly proprietary drivers for graphics and wifi. Wait a while! Are you sure that this is what you want? Maybe you want to keep something that is on the drive? In that case you should stop the installation and copy the important data to another drive. Maybe you want to select another alternative. If there is only one hard disk, skip a couple of steps to the 'Where are you?' screen. Otherwise, on the 'Installation type' screen verify that the drive selected on the Select drive list corresponds to the drive on the chart (e.g /dev/sda). If you have removed the internal drive(s), there should be only one drive, that is available as a target, your external drive. If the external drive is an HDD or SSD, it is ready to be used now. If you want a portable system (that works in most computers), you should think twice about proprietary drivers (typically for graphics and wifi). The classic advice is to avoid installing proprietary drivers, but it means that computers with certain hardware will not work well (or at all). Disable the internal drive in an UEFI/BIOS menu. This works in several but far from all computers. d. Restore the flags to the EFI partition in the internal drive (with gparted booted from a live drive). This flag method is described in detail by @Tim Richardson in this answer to our common question. Old answer, do not use it anymore ! Insert live CD and plug in the USB key. Chose Advanced when selecting drive partition. Chose your USB key partition as the target. CAUTION: Chose your USB partition for the GRUB bootloader. After the installation process, boot on your USB key, not your hard drive. UNetbootin allows you to create bootable Live USB drives for Ubuntu, Fedora, and other Linux distributions without burning a CD. It runs on Windows, Linux, and Mac OS X. You can either let UNetbootin download one of the many distributions supported out-of-the-box for you, or supply your own Linux ISO file if you've already downloaded one or your preferred distribution isn't on the list. LiLi creates portable, bootable and virtualized USB stick running Linux. Are you sick of having to reboot your PC to try Linux ? No need with LiLi. It has a built-in virtualization feature that lets you run your Linux in Windows just out of the box. All three programs above allow you to install any Linux operating system to a flash drive, but the persistence feature (allows you to save any changes made to a LiveOS installation permanent to be used even after reboot) is only available for Ubuntu and its many other flavors. This process assumes you are installing from a live cd. While a live usb should work fine as well, the cd option is theoretically the safest, as there is no chance of overwriting the cd during the partitioning. I recommend you start off by disabling your internal HDD in your BIOS first, as this makes sure there is no chance of accidentally overwriting your internal partitions. 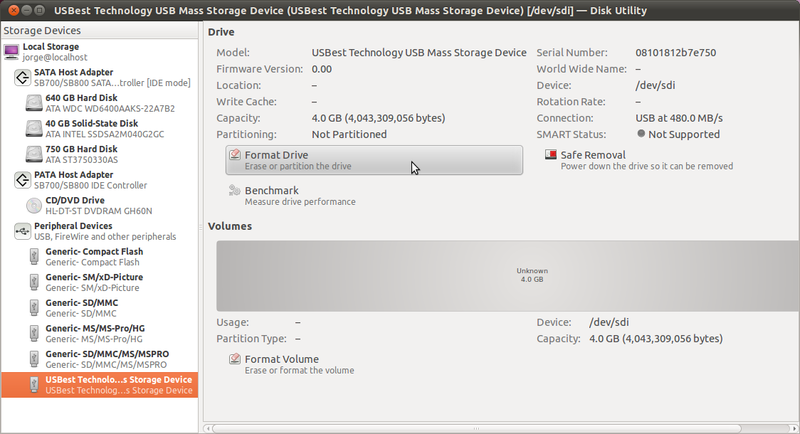 Also, the partitioning step of the Ubuntu setup will be much easier, since it will only detect the USB drive. With other words, it's best to make the USB drive the only storage device present on the machine during the installation. Next, boot up the live cd and initiate the installation as usual. Make sure you choose "use whole disk" if you disabled all other storage devices, otherwise you will have to do manual partitioning. In the last case, create an ext4 partition on the USB stick (make a partition table if there isn't one) and, if necessary, a SWAP partition if you intend to run heavy applications. Set the mount point to /. don't touch the other storage devices and their partitions! When the setup asks for the bootloader location, choose the device name of your USB drive. This can be /dev/sda, /dev/sdb, so on, but don't choose a partition (e.g. /dev/sda1). Wait for the installation to complete, then reboot. Make sure your machine boots from the USB drive. This can be made sure either from the boot menu (usually esc or a function key) or from the bios, where the boot sequence can be altered. If everything went okay, Ubuntu should boot from the USB drive. If GRUB shows up, choose the first option. This makes sure that update-grub does not detect any other OSes that may be present on the system, as they do not matter for your Ubuntu USB drive installation. Also, when you boot up your USB drive from a strange computer, the OSes on its internal drive will be included into GRUB when a kernel/grub update occurs. This is unwanted. Also, make sure to turn back on your internal storage devices from your BIOS. The process of doing a full installation of Ubuntu to a USB flash drive is identical to installing Ubuntu on a hard drive except for the installing the GRUB bootloader. 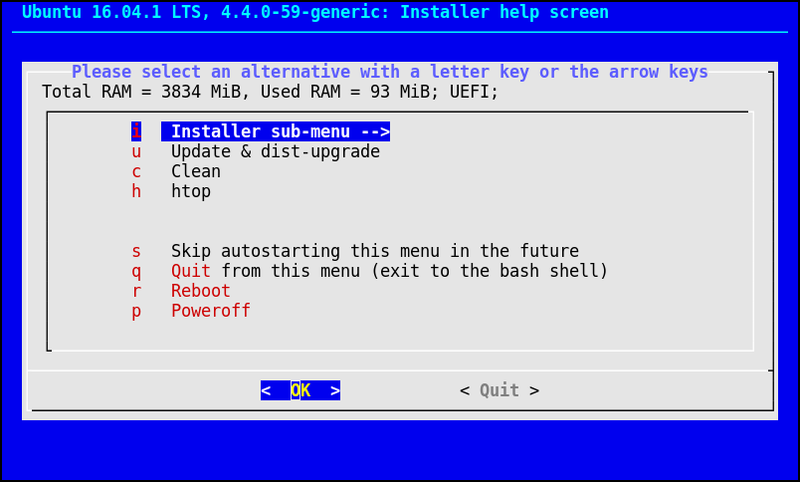 All of the steps to follow in the Ubuntu installer are identical except for installing the GRUB bootloader. Installing the GRUB bootloader on the USB flash drive will replace the existing GRUB bootloader on the hard drive which you don't want to do, unless you disconnect the cables to your hard drive(s) first before you start the Ubuntu installer to do a full installation of Ubuntu on a USB flash drive. So disconnect the hard drives first, then you can install Ubuntu on a USB flash drive. You can alternatively do a full installation of Ubuntu on a USB flash drive without disconnecting the internal hard drive cables first by selecting the Something else option in the Installation type screen of the Ubuntu installer. You need to create only a single / partition (root partition), no swap partition, and change the installation of the grub bootloader to the USB flash drive. Double-check your partitioning choices that everything that will be changed is only changed on the USB flash drive, then click the Install Now button in the lower right corner. Additional information about a full installation of Ubuntu on a USB flash drive. I recommend that the USB flash drive be at least 16GB. A USB 3.0 flash drive is a lot faster than a USB 2.0 flash drive. A swap partition will cause necessary read/writes to the USB flash drive, which will slow down the operating system and shorten the life of the USB drive. So select the manual partitioning option in the Ubuntu installer and create only a single / partition (root partition) without a swap partition. Change the installation of the grub bootloader to the USB flash drive before clicking the Install Now button in the lower right corner. The advantage of using a USB flash drive lies in its portability, not in its performance. The performance of a full install of Ubuntu on a 16GB USB flash drive is nothing like what you would get from running Ubuntu in a virtual machine application such as VirtualBox. Tested on Ubuntu 16.10 host, 16.04 USB, Lenovo Thinkpad T430. Previously mentioned at: https://askubuntu.com/a/848561/52975 but here are more details. From inside the emulator, do a normal Ubuntu install that erases the old disk. Installation took a bit longer than on a hard disk, but worked. The created file was still there. OP asks for "without touching my existing Ubuntu install." If you want to boot from your external device, not just install Ubuntu on it, you need to work around an installer bug which rewrites your boot partition on your internal drive and does not install an EFI boot partition on your external device, no matter what you tell the installer. Here's what works for me in Ubuntu 18.04, 18.10 and 19.04. Tested onThinkpad T480 & P50, dual boot Win 10 & Ubuntu. I have turned off legacy boot. UEFI is 100% in use. I have installed Ubuntu & the boot-loader onto USB sticks and drives at least six times using my solution. Installing onto a second drive is a pain because the ubuntu installer clobbers the first EFI partition it sees, which is the one on the internal hard drive, regardless of any attempt you make to specify an alternative location for the EFI partition. So when you try to set the bootload device to your target USB drive, you are ignored. It's a fairly old bug, but as we head into 19.04 release, still present. Summary: To workaround it, disable the internal EFI partition by using gparted to edit its flags immediately before beginning your install. Then the installer won't find it, and the bug is not tripped. Later, re-enable the flags. This is a trivial step. It is almost the logical equivalent of physically disconnecting the internal drive, which for sure also works around the installer bug. Before you start the install: You'll need a standard ubuntu live USB device, and a target drive to install to. Boot into Ubuntu live USB in the "try first" mode. re-partition your target external drive with a GPT partition table. Make a 500MB partition type FAT32. You may as well also set up the desired partition(s) for your Ubuntu install. You may find it handy to label the desired / partition because when you install you will have three drives: your internal drive, the live image installer drive, and your target drive. After applying those updates, change the flags on the small 500MB partition you just created. Right click on the small partition, and Manage Flags. These changes are actioned immediately (but note, you must actually create the partition first by completing the previous step) Tick to turn on boot, esp and hidden. You have booted with a live-disk USB image, as per a normal ubuntu install. So you have two USB devices: your target device, and the live-disk USB drive. Edit the EFI partition flags on your internal drive and untick those same three flags that you set on the target device EFI partition. Now, when you install, the installer will see only one EFI partition, on your target device. This is the novel step which I haven't seen documented elsewhere. Begin an ubuntu install. Proceed until you see the disk setup tab of the installer. You want the fully manual approach of course, "Something else" on the partitioning stage. If your target drive is mounted as sdc and the EFI partition you made is sdc1, then you will be installing the boot loader onto device sdc, and the EFI partition will be sdc1. Scroll to find that partition. It should say "efi" in the Type column. Click "change" to be sure: The installer should say "Use as: EFI System Partition". You won't actually be changing anything. No need to format it. As you scroll through the partitions, review the Type column. There should be no EFI partition on your internal drive, since you turned off the partition flags on your internal drive EFI partition. Of course, the partition still shows up as a FAT32 partition. That's ok.
You will also see the EFI partition of the live disk you booted from to do the install, that's ok.
Mount your desired target partition for / (sdc2, perhaps) and do a normal install. After the install, reboot to the new installation. You will need to use your BIOS "select boot device" option. On my Thinkpads, F12 is the shortcut to this part of the BIOS menu. You should see several choices in the boot menu, and one of them is the external drive. Some bios menus show the default label as 'ubuntu' so it's a bit confusing to see it more than once. Sometimes changing the boot device causes the BIOS boot to restart (it does on my Thinkpad), it looks like something bad happened, but it's ok.
Later when you boot without your USB stick, the bios should be smart enough to revert to the last known good EFI device (your internal device), but you may need to reselect an EFI boot choice manually. If you get duplicate EFI boot options labelled ubuntu, you can fix it. Relabelling EFI menu options is very handy, but a bit tricky. You are booted from the first row in the list. Things have changed since 2011, Nvidia drivers are no longer required for Unity and unlimited persistence using casper-rw/home-rw partitions is possible, (but not with recent Ubuntu syslinux type boots, (SDC, Unetbootin, Roofis, Universal, etc)). Mkusb is an installer that will fill all of the op's requirements, (if Nvidia drivers were only needed for Unity). The user is given a choice of setup options and can select the percentage of space used for the persistent partitions, mkusb will then make remaining disk space available to Linux or Windows as storage. https://help.ubuntu.com/community/mkusb . For Ubuntu 12.04 through 16.10 (all currently supported versions and flavors) the documented requirements vary but regardless an 8GB flash media should be sufficient to the task. A 16 GB version doesn't cost much more and can provide some "running room". The process itself couldn't be simpler. Burn the image to optical disk with your preferred OD image writing software. I'm rather partial to K3b but any optical disk burning software that supports the "Burn image" option should be suitable. If any part of this process is unclear to you please drop me a comment and I will attempt to clarify. Note that if you are using a flash drive to install from, you'll need a second flash drive for your target installation. EDIT: Another option would be to perform a Netboot Installation from the Internet I have not attempted this personally but include it as an option here in an attempt to cover all the options. If you are careful there isn't much risk of overwriting the MBR of an existing drive in your system. After booting the live system you can run sudo fdisk -l from the CLI or Disks from the GUI and determine which drive is your valid usb target. Once installation is complete you should be able to boot from your flash drive on any system with similar architecture simply by selecting your flash drive as the boot device in the BIOS. It has been described here and in many other places how to install Ubuntu into a USB drive like you install it into an internal drive. It is straight-forward to do it with the standard installer (Ubiquity), if you can disconnect or unplug the internal drive. It works in either UEFI mode or in BIOS mode, the same mode as was booted when installed. But if you want a USB drive with an installed system, that boots in both UEFI and BIOS mode, it is more difficult. I made such systems and prepared compressed image files, that can be installed in linux with mkusb directly, or in Windows in a two step procedure, extraction and cloning (and fixing the GPT). mkusb does it all, including fixing the GPT. The mkusb Launchpad project is here. The systems created from these compressed image files are quite portable between computers, not quite as portable as a persistent live system, but more flexible, when you want to update and upgrade the system (kernels, drivers etc). Look for the newest files with updated versions of the installed program packages. uploaded at UEFI-and-BIOS/torrent where you also find a short description. [Left]click on the torrent link, get to the attachment page, and there you right-click on the link and select 'save link as' to get the torrent file. Create a live USB or DVD using SDC, UNetbootin, mkusb, etc. Unplug the power cable from the hard drive or unplug the hard drive from the laptop. Insert the Live USB or Live DVD. Start the computer, the USB/DVD should boot. Select "Download updates while installing" and Select "Install this third-party software", (optional). At "Installation type" select "Something else". (Full disk encryption is not working with flash drives). Confirm target device is correct. Click Continue on the drop down. Click "Free space" and "+". Make "Size..." about 2000 MB. Location = "Beginning of this space". "Use as:" = "FAT32 file system". Click "free space" and then "+". Select "Primary", "Size ..." = 4500 to 6000 MB, "Beginning of this space", Ext4, and Mount point = "/" then OK. Select "Primary", "New partition size ..." = 1000 to 6000 MB, Beginning of this space, Ext2, and Mount point = "/home" then OK. Select "Primary", "New partition size ..." = remaining space, (1000 to 2000 megabytes, or same size as RAM), Beginning of this space and "Use as" = "swap area" then OK. Confirm "Device for boot loader installation" points to the root of the USB drive. Default should be ok if HDD was unplugged. Insert your name, computer name, username, password and select if you want to log in automatically or require a password. Selecting "Encrypt my home folder" is a good option if you are worried about loosing your USB drive. Turn off computer and plug in the HDD. Note: You may omit disabling the hard drive if after partitioning you choose to install grub to the root of the USB drive you are installing Ubuntu to, (ie sdb not sdb1). Be cautious, many people have overwritten the HDD MBR as default location for boot loader is sda, any items in the internal drive's grub will be added to the USB's grub. You may do an update-grub later. Mkusb makes a great base for many bootable pendrive projects, from grub2 bootable Puppy Linux to multiboot Persistent systems, multiboot Full systems and mixed/hybred Persistent/Full systems. Use mkusb to make a Live system on a USB (2GB or larger). Use mkusb to make a Persistent system on a USB 16GB or larger, using default settings with ~12GB persistence, (remaining NTFS partition is used as Windows accessible data partition). Open GParted and delete sdb4, the ISO9660 partition and expand sdb5 into the recovered space. Remove HDD before proceeding further, (optional but recommended, highly recommended in UEFI mode). Select sdb5, (on the target drive), and click Change. Select sdb5 for boot loader installation. Cut grub.cfg from sdb5/boot/grub and paste to sdb3/boot/grub, overwriting the existing grub.cfg file. Boot the target drive and run sudo update-grub, (optional). I figure this should work on any computer a mkusb built Persistent drive works on. Please comment if it does not work for you. Further discussion on creating drive using this method in UEFI mode starting at: https://ubuntuforums.org/showthread.php?t=2213631&page=17&highlight=usb post 169. The persistent install is persistent the way you want it -- the menu shows "install" option anyway. Just select "Try Ubuntu" to boot your custom Ubuntu. 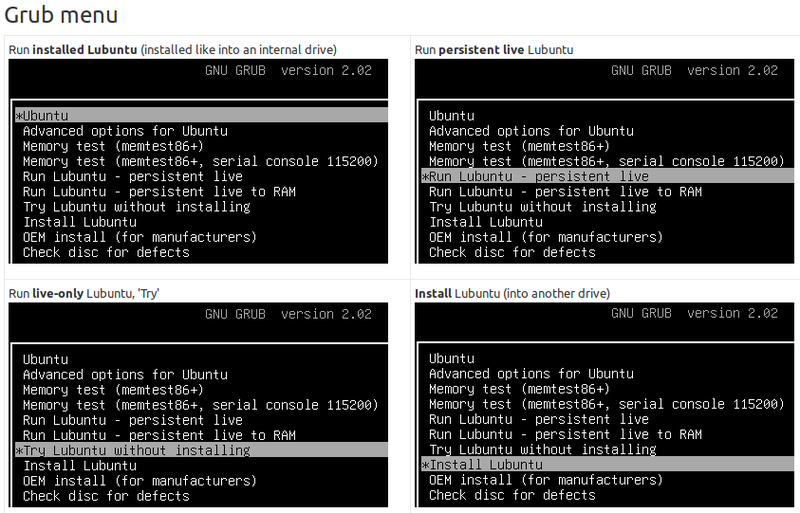 Another way to start Ubuntu installation is to get to Grub console from Grub2 Boot Menu. It will fire up installation from Ubuntu ISO file on your HD. This will fire up normal Ubuntu installation process just like you see it when installing from Ubuntu CD. From there you can choose your USB Flash Drive to install Ubuntu on it. First prepartition your External drive. Make a 500MB fat32 partition that is flagged as ESP (EFI system partition) Make a 4GB swap partition. Use the rest of the disk for your / partition. If you want separate /home and/or other partitions make them also. gparted is good for this step but any partitioning tool will work. When you install ubuntu, chose manual partitioning. Make sure the ESP and swap partitins on the internal drive and installer drive are set to "Do not use". Assign the partitions on your external drive. Then, Install ubuntu. Now, external media requires /efi/boot/bootx64.efi in the ESP partition order to boot. So copy /efi/ubuntu/grubx64.efi to /efi/boot/ and rename to bootx64.efi. If you are using secure boot, /efi/ubuntu/shimx64.efi will need to be copied and renamed. Note: you will need to temporarily remove the ESP flag in order to make this change. I was able to do this using 2 USB's: one created as a USB Ubuntu installer the normal way (the installer USB), another to be the OS USB. I recommend to remove your HDD's first. Now I've got an OS USB I can boot from anything! yay. This answer describes a combination of portable systems that boots and works in most PC computers (laptops, desktops and workstations with Intel or AMD processors). The Lubuntu systems in this compressed image file were installed and combined inspired by a method originally described by C.S.Cameron. This provides the stable bootloading system of mkusb. The descriptions in this link and links from it can help you create a similar system with the same method. It can also help to clone from the compressed image file and look into the details in order to get everything working. First of all, make sure that you boot your Installation Media in BIOS (Legacy) Mode, not in UEFI mode. The problem you have is probably that you installed Ubuntu on your USB flash drive, but GRUB (the bootloader) was installed on the hard drive. To fix that and install GRUB on your USB drive, you need to select the correct device when installing Ubuntu. When you get to the partitioning screen, you should have a drop-down list in the bottom (I can make some screenshots later if you need). There you can select, what device GRUB should be installed on. Make sure though that you select an entry without a number after /dev/sdx (x can be any letter). Assuming you installed Ubuntu on the /dev/sdc1 partition (you need to check yourself what the correct partition is), you should select the entry starting with /dev/sdc (Without any number behind it) in the drop-down menu. After that, continue with the Installation as usual. I'll later add some information on how to revert the Hard Drive to it's old Bootloader. Can a full version of Ubuntu be Installed on a USB Drive? Can I install Ubuntu to my 32 GB USB pen drive? How can I save settings on a Live USB? Is there a way to install Ubuntu on usb pendrive as normal instalation (not live cd)? How to install and use Ubuntu from a USB flash drive on Windows 8? How do I install Ubuntu Server on Foxconn Nano PC? How to install Ubuntu off a USB? How to copy symlink files from the ISO Ubuntu installer to a usb stick ( for uefi machine )?